Weather on Snoqualmie Pass is pretty unpredictable. It could be sunny one minute, then cold and rainy the next. Fall is in the air and with winter right around the corner, crews are working hard to improve a five mile section of I-90 east of Snoqualmie Pass before the snow starts falling. Our contractor, Max J. Kuney, is working around the clock on the first three miles of the I-90 Snoqualmie Pass East – Hyak to Keechelus Dam project from Hyak (milepost 55) to the Lake Keechelus Snowshed (milepost 58). So far this year crews have built the new eastbound and westbound bridges at Gold Creek and part of the animal undercrossing. They’ve built the eastbound bridge over Rocky Run Creek and poured more than 11,000 cubic yards of concrete for the new eastbound lanes, which will be open to traffic in November. Then there is the amount of rock crews brought down during blasting operations. Crews removed approximately 400,000 cubic yards of material from the slopes above I-90; that’s enough material to fill more than 33,000 dump trucks. But rock blasting isn’t done yet. Blasting closures will most likely continue until later this fall. If you’re traveling over the pass visit our What’s Happening on I-90 website for closure dates and times. This portion of the project is scheduled to be complete in 2013. Next spring our new contractor, Guy F. Atkinson, will start improving the final two miles of the five mile I-90 project from the Lake Keechelus Snowshed (milepost 58) to the Lake Keechelus Dam vicinity (milepost 60). But until the snow starts falling this year, Atkinson crews will be working hard to cut down trees and clear the project area in preparation for next year’s construction. They’ll be crushing rock for the first layer of the new six lane highway and building up the embankments for the new lanes along Lake Keechelus near Resort Creek. This portion of the project is scheduled to be complete in 2017. It’s been a busy 2011 construction season and as long as the weather holds, crews will continue to stay busy building a wider, safer and more reliable I-90 east of Snoqualmie pass. How bad is your commute? What would you rank it against other cities? Unlike college football, we don’t want to be number one as in the number one most congested area. The national congestion report, released this week by the Texas Transportation Institute, is different from the BCS, and has a lot more science behind it. As you can see by USA Today’s graphics, Seattle didn’t make the top 10. We’re 12, down from 11 last year. Take that, LA. Washington, D.C. is number one for congestion and the study authors say that’s a mixed blessing. More congestion comes from…a recovering economy. So, DC is congested and on its way back from the recession. So what does “doing it right” mean for you in your car? You may notice some of the small changes, like ramp meters that add cars at an even pace, all the new overhead signs on I-5, I-90 and SR 520 that adjust the speed limits or warn you about traffic or blocked lanes ahead. Ever check out our webpage and peek at our cameras to see what traffic is doing before your head out? We’re adding more of those between Marysville and Everett and into Arlington and even across Snoqualmie Pass. And everyone knows about our highways heroes, the WSDOT Incident Response teams who bail drivers out with a gallon of gas or a quick fix to a flat tire. These are all new tools we use to get you where you want to go safer and faster. It’s linked in to our traffic management centers and know as “Intelligent Transportation Systems. ” Smarter roads. We’re adding lanes, widening freeways, adding on-ramps and building new interchanges too. Not only do these projects put Puget Sound people to work, it helps put Puget Sound in a position to handle all the newly employed drivers when the economy comes roaring back. Over the past five years, more people have moved to the Puget Sound area, but our congestion hasn’t gotten worse, this new report proves it’s stayed steady and in some places it’s better. The worst spot in all of Puget Sound was Tukwila to Bellevue. Since we opened those new lanes and ramps on I-405, drive times have improved by 15 minutes. It’s the same story between along SR 520 from West Lake Sammamish Parkway to SR 202. If you drive those stretches every day, that time adds up. Some of the projects nearing completion along I-405 in Bellevue (this weekend! ), as well as SR 18/I-5 in Federal Way (spring 2012) and I-5 Lynnwood (next week!) will make driving safer, and improve congestion. When the economy finally picks back up, and more people go back to work, we’re in a better position to handle the returning employees. We’re looking to keep Seattle moving down the next congestion report list. Crews will close northbound I-405 this weekend. it will be a new day and new way in Bellevue. 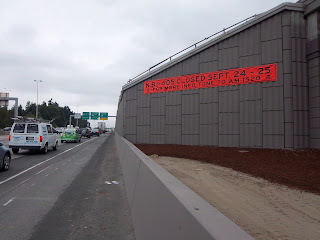 You may recall we were going to close northbound I-405 last weekend. Then we didn’t close it. It wasn’t a trick – the weather forecast just didn’t cooperate. We intend to close northbound I-405 again this weekend. The work requires dry weather because of the paving and restriping. If that doesn’t work, we’ll shoot for Oct. 8-9. When the freeway re-opens Monday morning, drivers will use new ramps to get from Bellevue to Seattle, Kirkland and Redmond. If the weather cooperates, drivers should prepare for a northbound I-405 53 hour weekend closure in Bellevue, starting at 11 p.m. Friday. When the freeway reopens at 4 a.m. Monday, drivers will take new ramps to I-405 and SR 520 in Bellevue. It will be a big change for drivers headed northbound on I-405 through Bellevue. We’ll have more than 200 new signs in and around Bellevue showing the way to go, but it may take you a few days to adjust to the change. If you slip up, you may end up in Kirkland when you wanted to go to Redmond. Going to SR 520? Use NE 10th Street. Drivers will no longer have access to SR 520 from NE Eighth Street. Headed to I-405? Use NE Eighth Street. Drivers will use a longer ramp to reach northbound I-405. Mainline drivers should prepare to exit to SR 520 earlier from northbound I-405. The first official weekend of fall will be a busy one for crews rebuilding the Swamp Creek interchange in Lynnwood. Monday, Sept. 26 will mark a major milestone in improving the challenging I-405/SR 525/196th St. merge – but before we can celebrate, we’ll need to close down the interchange for the weekend so we can complete the new on-ramps and connect them to the southbound lanes of I-5. So what does all this mean for you? During the weekend, you’ll need to watch for detour signs, scope out alternate routes to avoid getting stuck in traffic and plan some extra time into your schedule. Our busy weekend kicks off in earnest Friday, Sept. 23, when the ramps from I-405 and SR 525 to southbound I-5 close around the clock until 5 a.m. Monday, Sept. 26. You’ll also want to prepare for nightly closures of the southbound I-5 off-ramp to 196th St. on Friday, Saturday and Sunday. We’ll have detour signs posted to help you get around the closed ramps. Northbound I-405 drivers will be detoured to southbound I-5 via the 164th Street SE interchange, but there are other options if you want to avoid delays: SR 522, SR 527, SR 524 and SR 104 are other great ways to reach southbound I-5. If you’re on southbound SR 525, you can take southbound SR 99 to 196th Street SW or 220th Street SW to reach southbound I-5. You can also reach southbound I-5 via Alderwood Mall Parkway and westbound 196th Street SW. When we open the new ramps at 5 a.m. Monday, Sept. 26, it’ll be a big improvement for drivers – but we still need you to stay plugged in to construction. Even though the I-405 and SR 525 ramps will be open, the new off-ramp to 196th St. won’t be. That ramp will open Friday morning, Sept. 30 – and in the interim, drivers will need to pay close attention to the temporary off-ramp. As crews finish up the new 196th St. off ramp, you can expect to see a temporary traffic island that will separate mainline I-5 traffic from on-ramp traffic and traffic exiting to 196th Street SW. If you use the 196th St exit, you’ll need to move into the right lane prior to the I-405 interchange to avoid missing the exit. There are times when our crews really shine. Thursday was one of those days. At 7:45 a.m. a truck carrying liquid nitrogen overturned. The pictures were creepy. A low, menacing mist spread silently across all lanes of I-5. No one knew what it was but Washington State Patrol knew enough to tell everyone to stay back. It didn’t go away. It just kept creeping along. Washington State Patrol reported the crash to our maintenance staff at 7:45 a.m. It was described as an “all hands on deck” crash, a semi-truck on its side with an unknown substance pouring out. Every maintenance person in western Whatcom County was immediately diverted to the crash site or participating in the crash response. The traffic cameras were turned to the area and we could see the thick mist creeping across both directions of I-5. We instantly implemented the detour plans we developed for the Vancouver Olympic Games in 2010. These plans were a multi-agency effort. Our incident response staff has detailed maps on how to detour traffic from every interchange in Whatcom County onto city streets and county roads and take them back to the freeway again. We contacted Bellingham Fire, Bellingham Police, and Bellingham Public Works to help us with I-5 traffic even as they were preparing their own detours. At that point our primary concern was life safety. Bellingham Fire advised us not to allow traffic to drive through the plume. Our staff at both collision scenes turned traffic around and backed the trapped drivers out of the incident scene. We contacted Cascades Communications, the radio group which controls most of the Bellingham and nearby radio stations, to get the word out locally. City and state teams worked seamlessly to close all southbound and northbound ramps and lanes in the area. By 7:57 a.m., nearly everything was sealed off. Emergency personnel were all advised to stay back at least 300 feet. Washington State Patrol did not allow anyone to drive or walk through the mist. It was raining and drivers were distracted by the scene which contributed to other fender benders. 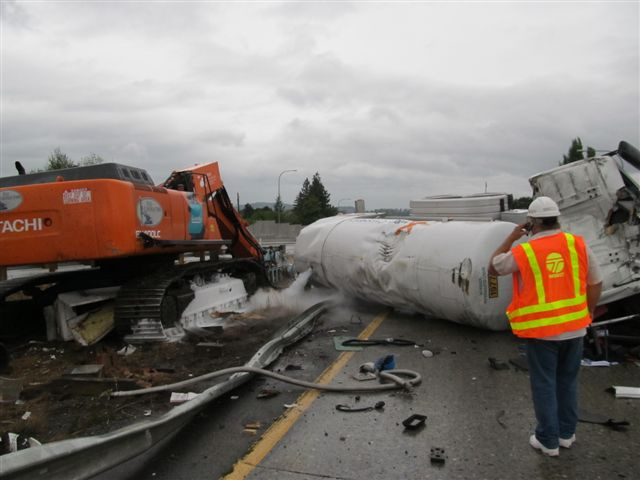 A third major collision occurred, also on northbound I-5 near the overturned tanker. A semi-truck jackknifed and collided with a boom truck which also required our staff to respond. It wasn’t until 8:36 a.m. that we got the all clear to go near the tanker. There was no risk of explosion. The tanker was in pieces. Its diesel tanks were leaking. 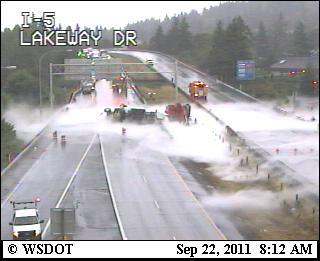 The second semi-truck on southbound I-5 about a mile away, was also on its side and leaking fuel from its saddle tanks. Then, of course, there was that third crash. The clean up was a two-stage process: upright and haul away the crumbled semi-truck and tanker truck – again, two crash scenes a mile apart - then clean the road. We pumped more than 50 gallons of fuel from the tanker truck. We used more than 30 bags of floor dry and one ton of sand to sop up the spilled fuel. All of this was made more difficult by the fact that the liquid nitrogen had frozen solid in several areas. The State Street interchange was congested as all the traffic from the freeway was funneled into the off ramp and the city street system. We attempted to keep traffic moving around Bellingham by changing signal timing and working directly with engineering staff from the City of Bellingham. The clean-up crews worked quickly and all southbound lanes were open by 9:48 a.m. and all northbound lanes were open by 12:06 p.m.
How do we know where the lane lines go? To be honest, I’ve never really wondered how our striping crews and contractors know where to paint the lines on our roads. I guess I just never thought about how it happened. It’s actually an interesting question, though, when you stop to think about it. I mean, when we repave a road and cover up the old lines, how does the striper know where to put the new lines again? How do they keep them so straight? I probably would have never thought of the question either. It just wasn’t on my radar. But that’s the nice thing about my job; I get asked some great questions. This time Laurel, who reads my Whatcom County email updates, asked the question. So I had to do the research to figure it out. Here’s what she asked: While driving northbound I-5 (south of Bellingham) during the recent repaving, I found myself wondering how on earth they get the stripes in the right place on the road. It can't just be that the person operating the striping truck is a steady driver, and I can't imagine a GPS system would be precise enough. What's the secret technology? Answer: Before we begin the repaving, we reference where the center line is by placing markers off to the side of the road. We put markers down at the beginning and end of every curve and about every 500 feet along the road. Once the markers are in place, there are a variety of ways we can repaint the lane lines again. Often, we’ll use a typical tape measure and spray-paint marks for the shoulder and center lines, using the markers (along the side of the road) as measuring points. 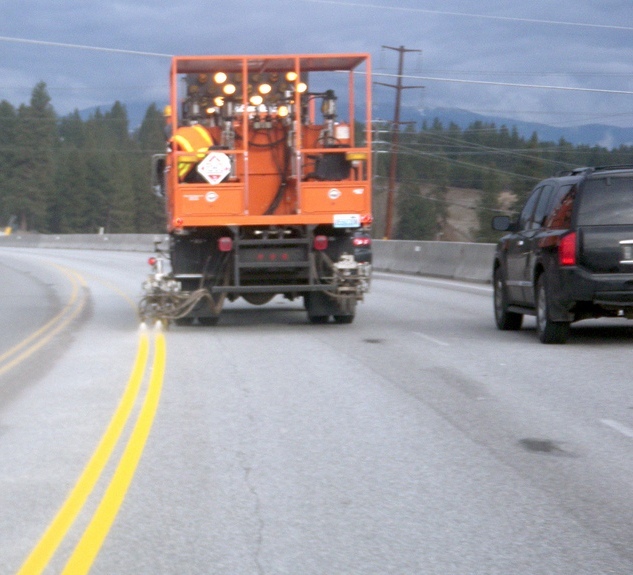 Then, we may use a string line or survey instrument to put spray-paint marks on the road at 50-foot intervals. The marks are often referred to as a “tattle-tail” and help the striper know where the final lane line goes. The striping truck is quite computerized and even has a video camera on board. The driver keeps the camera pointed at the tattle-tail line to help keep the final lane line relatively straight. And that’s how it’s done – no secrets involved. National Child Passenger Safety Week, September 18-24, 2011 provides the opportunity to remind and reinforce safe driving and travelling behaviors. Research by the U.S. Department of Transportation shows that when used effectively, child passenger safety seats can reduce the risk of fatal injury by 71 percent for infants (children younger than 1 year old) and by 54 percent for toddlers (children between 1 and 4 years old). Although everyone should buckle up every time they travel in a vehicle, parents and caregivers have a special responsibility to ensure that children are properly secured and protected during travel. That’s why it’s critical that parents with children under the age of 14 get the facts on the child passenger restraint laws that exist in their state and the penalties for not following those rules. An important part of ensuring a child’s safety is selecting the proper car seat. Seats should be chosen based on a child’s age, height and weight and it always should be placed in the back seat of a vehicle. As a precaution, car seats also can be registered with the National Highway Traffic Safety Administration so you will receive notifications on defects and recalls. Car seats are essential safety devices and require proper installation. Be sure yours is correctly installed by getting it inspected by a certified technician at any of the participating locations on Saturday, September 24 during National Seat Check Saturday. This closure has been canceled due to inclement weather in Sunday's forecast. If you drive northbound I-405 to SR 520 in Bellevue, you know it can be slower than molasses on a cold day. Motorists have come to expect slowdowns for up to eight hours a day, with 60,000 vehicles jockeying for position between NE Eighth Street and SR 520. Sitting in traffic, you have enough time to plan the evening’s dinner, mentally write your grocery list, and practically organize your sock drawer, if only in your head. Maybe you’re not eager to race home and actually organize your sock drawer, but I bet you’re tired of the slog. Come September 26, it’s going to be a new day, a new way for drivers headed northbound on I-405 through Bellevue. But before that new day dawns, we will close northbound I-405 completely for the weekend, starting at 11 p.m. Friday, Sept. 23, between NE Eighth Street and SR 520 in Bellevue. The freeway will open in time for the Monday morning commute. What’s the hubbub about and why are we closing the freeway? We’re connecting new ramps from downtown Bellevue to I-405 and SR 520. We need to close the freeway for the weekend to connect the new ramps and get all the paving and restriping done. And we’re doing it all in a weekend to open the new ramps nine months ahead of schedule, bringing drivers the benefits early and minimizing additional closures. The new ramps, part of the $107.5 million Bellevue Braids Project, will eliminate the weave drivers now experience on northbound I-405. Driving that stretch in Bellevue won’t feel like molasses anymore. The changes will improve traffic flow and reduce congestion-related collisions. We’re pretty excited to be bringing drivers these benefits early. Bottom line: You’re going to have to pay attention! Don’t think about that sock drawer. We’ll have more than 200 signs in and around Bellevue showing the way to go, but it may take you a few days to adjust to the change. If you slip up and follow old habits, you may end up in Kirkland when you wanted to go to Redmond. Once you’re used to it, we hope you’ll appreciate the improvements. Mainline drivers should prepare to exit to SR 520 nearly one-half mile earlier from northbound I-405. 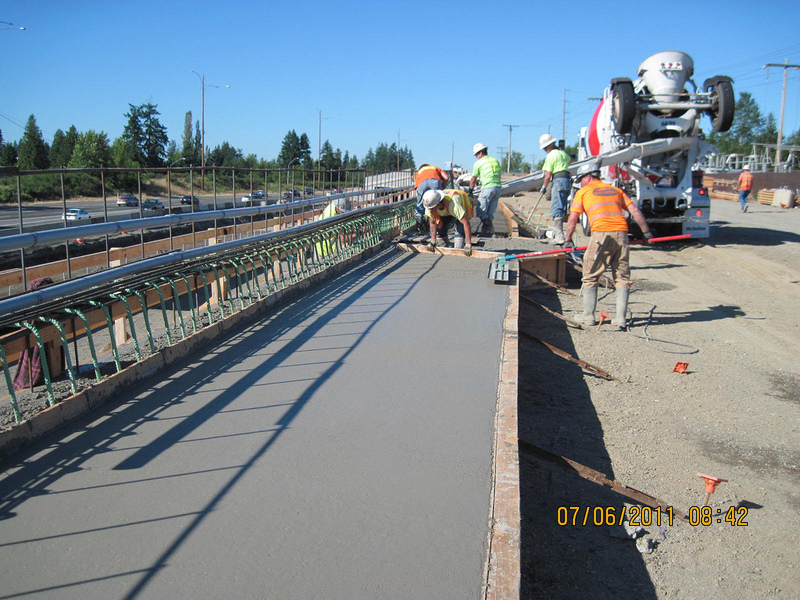 In spring 2012, it’ll get even better, when crews will open another leg of the ramp to SR 520, east of 124th Ave NE. The ramp will allow drivers to bypass the busy 124th Ave NE, connecting to SR 520 at about 130th Ave NE. You’ll have even more time at home. Maybe by then, you’ll want to organize your sock drawer. We’re constantly looking to improve the services we offer on our website. Recently, we participated in a usability study to see how we could improve it and better help you find the information you want. The study gave us a great deal of information and ways to improve the website, like making our traffic maps more consistent, alphabetizing our travel links, and having fewer links on each page. We made one change today that I wanted to make sure you knew about, because, like any change in a website, it may throw you off a little at first but we hope you will find value once you adjust to it. The thing that stood out most to us after the study was how difficult it was to get to our most important traveler information. Our cameras, mountain passes (very important in the winter), traffic maps, travel alerts and weather are really our core services that you need to make the most informed decision before traveling. We’ve now consistently displayed those five key links along the top left of every traffic page on the website. We hope you find value in these new links as we approach another forecasted La Nina winter. We are working on a flowmap and travel times across I-90, new cameras on I-5 between Lacey and Tacoma, a change in the tabs we use in the top navigation across the site, and making sure that wherever you are in our website you know exactly where you are and that you can get exactly what you need before you hit the road. If you see anything else you wish we could change about the website, do take the time to let us know - we're listening. P.S. 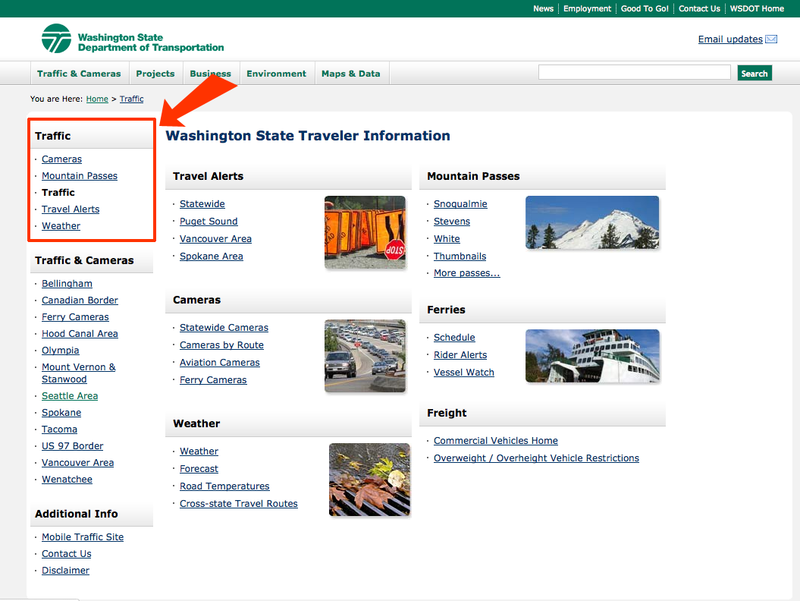 And don't forget, we also have Android and iPhone apps: Just type "WSDOT" into the market place of each app store. We also have a small mobile enhanced website available if you can't be at a desk or computer. Heading out for a morning jog may be more than just a lap around the neighborhood. Ask Reese Witherspoon who was hit by a car and ended up taking a trip to the hospital instead of completing her run. This incident is important to two reasons. First it is a reminder for many of us that we share the roads with cars, bikes, and joggers. And second, it draws our attention to senior mobility and driving because the driver of the car that hit Witherspoon was 84-years-old. SHARE THE ROAD – be aware that drivers are not the only road users. Watch out for walkers, joggers, bicyclists and motorcycles. OBEY TRAFFIC PATTERNS – know the rules of the road and obey them. BE VISIBLE – whether you are a SUV or a jogger make yourself visible to others. Seniors already make up a large portion of the driving public, and this demographic is continuing to grow. Did you know that by 2025, people aged 65 and older will account for 25 percent of U.S. drivers? As America ages, we need to address the challenges of keeping motorists driving for as long as safely possible and ensuring adequate mobility for those that can no longer drive. That’s why Roadwise Review and Posit Science’s DriveSharp program are such great resources. The AAA Foundation does not believe that anybody should have their car keys taken away simply because they reach a certain age. Instead, states should have a fair and comprehensive system to screen all drivers applying for new or renewed licenses to ensure they are medically and functionally fit to drive through procedures, such as eye exams and in-person renewal. If you are facing the decision with a loved one about when to stop driving, visit www.seniordriving.aaa.com for helpful information about how to deal with the very personal and often difficult challenges related to senior driving. The SR 433 Lewis and Clark Bridge is arguably one of the most impressive structures to stretch across the Columbia River. Built in 1929 by Joseph Strauss, the same man who engineered San Francisco’s Golden Gate Bridge, the steel behemoth towers 340 feet above the river and forms a mile-long link between Longview, Wash. and Rainier, Ore.
On a normal summer day, the gray bridge stands tall and proud as vehicles rumble across its deck and maritime traffic sails on the river below. 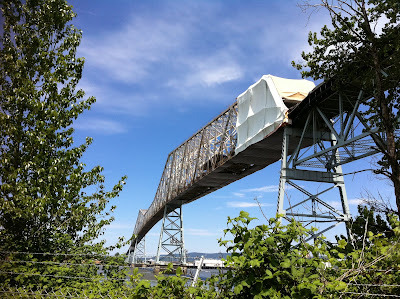 This summer, however, crews have wrapped several portions of the steel structure in large white tarps that give drivers the sensation of traveling through a tunnel, or maybe a large circus tent. The tarps form the outer layer of containment systems that teem with dozens of workers repainting and preserving thousands of steel beams that rise above the roadway. The structure is built out of nearly 12,000 tons of steel, and all of it is susceptible to rust. It has been 27 years since the bridge was last fully painted. The old coating is peeling away, and the underlying steel is badly rusted. If left too long, the rust will severely damage the metal and compromise the structural integrity of the bridge. At any given time, there are between 20 and 40 men and women working on the bridge. Our contractor, Odyssey/Geronimo JV of Houston, Penn., began work last year on the third and final phase of painting work. In 2008 crews painted the Oregon approach to the bridge, and in 2010 a separate team cleaned and painted the massive piers that anchor the bridge in the river. Odyssey/Geronimo has split their workforce into three teams to tackle the rust and recoat the bridge. The rigging crew assembles the scaffolding and tarp structures, called containment platforms. The platforms provide a work zone for the painters and help keep old paint and debris from drifting down to the river below. Inside the sealed containment platform, the blasting crew uses high-pressure air hoses to direct a coarse, gritty substance at the steel. The abrasion strips away old paint and cleans rust from the beams. By the end of this process, the 80-year-old metal shines factory fresh, looking as it might have when it first rolled off the Pittsburgh assembly line in the late 1920s. The old paint and debris is vacuumed out of the platform and safely disposed. The blasting team primes the exposed steel, and painting crews add an additional four coats of primer and paint to the metal. Each coat of paint has a unique purpose, but they all work to seal the metal against the elements and prevent future corrosion. The steel is still in good shape, which tells us that this project is taking place at exactly the right time. Rust hasn’t damaged the bridge beyond repair, making the painting process quicker and less costly than it would otherwise be. Painting teams endure dizzying heights, fierce winds and blistering heat to get the job done, but in the end, it’s worth it. By stripping the bridge down to bare metal, we are restoring it from the inside out to ensure the historic structure will continue to stand strong well into the future. What does it take to rebuild an entire freeway ramp, move it about 100 yards and raise it about 20 feet? A lot of workers and a lot of dirt. Late last week we opened a new ramp connecting Weyerhaeuser Way and westbound SR 18 to northbound I-5 in Federal Way (nearly a week early, by the way). And it was no small task. WSDOT Inspector Sam Al-Mallah oversaw the whole operation to make sure everything went smoothly. Al-Mallah has been with WSDOT for 20 years and this is one of the biggest projects he’s worked on yet. If you drive this area, you’re definitely going to notice some changes. Drivers headed on westbound SR 18 will enter the northbound I-5 ramp further east. They’ll share the ramp with traffic coming from Weyerhaeuser Way. This long-awaited project will completely transform how traffic merges between the busy I-5/SR 18/SR 161 interchange. Two new flyover ramps, including the one mentioned above, will eliminate lane weaving that can lead to congestion and collisions. It’s even more beneficial when you consider that roughly 7,200 semi trucks use SR 18 in this area every day. So what’s next? Later this fall, we’ll begin installing huge steel beams (called bridge girders) over I-5 for each of the new flyover ramps. That work will require a few overnight total closures of I-5 in Federal Way. Check the project website for more specific information as the work gets closer. “Rock scaling” is a method of removing rocks on unstable slopes before they fall on their own and can cause damage to property and/or people. We employ professional rock-climbers to rappel down a slope on safety ropes to remove loose rock by hand. Tools they typically use include scaling bars, hydraulic wedges, air compressors and pillows, drills, and splitters. This method is very effective on slopes where trees have taken root in cracks, and while continuing to grow, the cracks worsen and eventually rocks become very unstable and hazardous to our roadways below. Where the rock is removed by this method, it also results in a very natural appearance, as there are no visual signs of mechanical equipment or explosives being used to remove the rock. At one location on this project at Sherman Pass on SR 20, there were 2,300 cubic yards of rock removed, leaving a very natural appearance of a much safer section of roadway. “Rock Bolts” are long anchor bolts drilled into the rock to provide stability. A Hollow Ram Jack is used to test the strength of the rock bolt system by pulling the bolt to a certain required strength. “Boulder Busting” is a method of breaking large boulders up into smaller, more manageable rock to be hauled to another location. The process includes pre-drilling the rock, using a light explosive material, and setting off a charge.